Your private transfer takes you from Hanoi through the fertile countryside to Hon Gai, gateway to Ha Long Bay, a UNESCO World Heritage Site. Located in the Gulf of Tonkin, the bay is dotted with more than 3,000 limestone islands carved into fanciful shapes by the action of the water. Upon arrival, board an OVERNIGHT CRUISE that takes you to explore the tunnels, caves, pristine beaches, and floating villages that are sprinkled across the bay. While on board, enjoy a TRADITIONAL VIETNAMESE COOKING DEMONSTRATION with the ship’s chef. You may also choose to relax with a spa treatment. Early birds can participate in a TAI CHI DEMONSTRATION on the Sun Deck at the break of dawn. Disembark later this morning for a private transfer to Hanoi to catch a flight to Ho Chi Minh City, still known as Saigon to many. A short flight brings you to Siem Reap, your base for exploring the temples of Angkor. Constructed between the 9th and 13th centuries, the temples are unmatched among the world’s ancient ruins. Your PRIVATE GUIDED SIGHTSEEING starts at the best preserved of all the temples—ANGKOR WAT, which honors the Hindu god Vishnu. Next stop is ANGKOR THOM to see BAYON TEMPLE. One of the few Buddhist temples in Angkor, it features some 200 striking faces carved in 54 towers. Enjoy the afternoon at leisure. This morning, explore more of the Angkor temple complex on a PRIVATE GUIDED TOUR. Visit BANTEAY SREI, a unique, small temple built from red sandstone and dedicated to the Hindu god Shiva. Then, on to TA PROHM, which has been left relatively untouched, unlike many other temples. Here, the jungle surrounds you, and tree roots grow over and through the ruins. The afternoon is at your leisure. 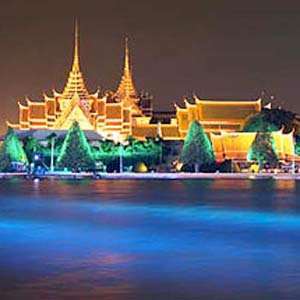 Today, fly to Bangkok, Thailand’s capital city. 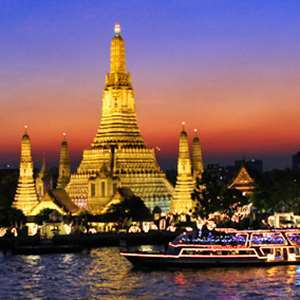 Today’s PRIVATE GUIDED TOUR starts with a BOAT RIDE through the klongs, Bangkok’s canals, to see family homes, temples, and the way of life that gives this city the nickname “Venice of the East.” Stop at Wat Arun, the TEMPLE OF THE DAWN, whose 260-foot-tall spire has become identified with Bangkok. Continue on to the GRAND PALACE, comprised of the Funeral Palace, the Reception Palace, the Throne Hall, the Coronation Hall, the Royal Guest House, and the TEMPLE OF THE EMERALD BUDDHA. Also visit the TEMPLE OF THE RECLINING BUDDHA, the oldest and largest Buddhist temple in Bangkok. It houses more than 1,000 Buddha images, including the 49-foot-high and 151-foot-long massive Reclining Buddha. Enjoy a full day at leisure to explore on your own. Today, fly to Luang Prabang. Today, enjoy a full day of sightseeing in this UNESCO World Heritage Site. Begin your morning by ascending MOUNT PHOUSI for beautiful views over the city and Mekong River. Then, walk through the historic town center stopping at WAT MAI, famous for its 5-tiered roof built in the traditional style of Luang Prabang. You will also visit the NATIONAL MUSEUM and WAT XIENG THONG, often thought to be the most beautiful wat, or monastery, in the city. The remainder of the day is at your leisure to explore further. A full day at your leisure. 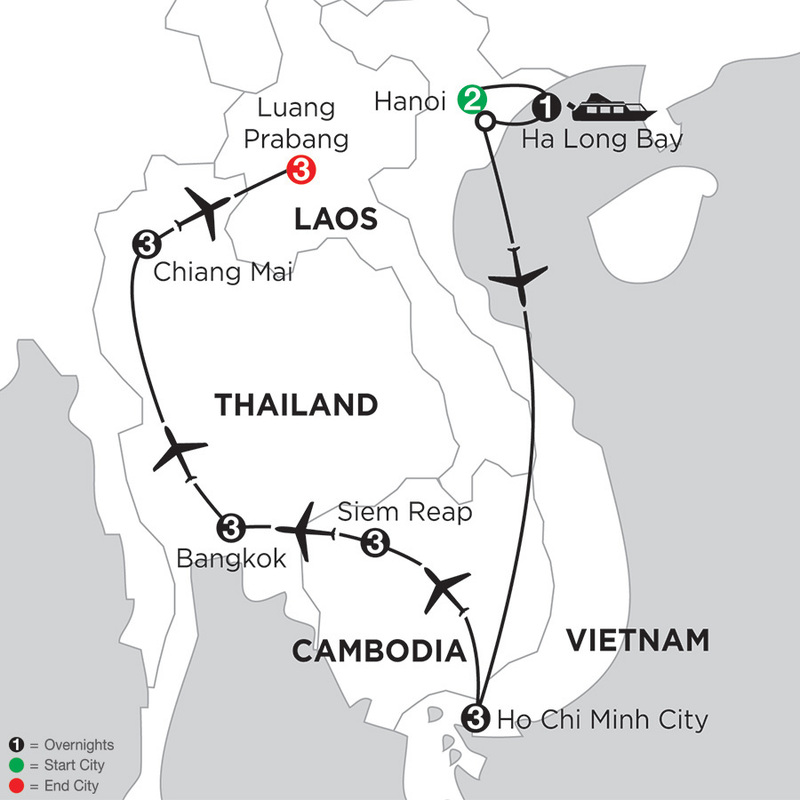 Perhaps consider an excursion to Kuang Si Waterfalls or a cruise on the Mekong River to Pak Ou Caves. Your Local Host can help with suggestions. Find yourself in the refined elegance of the Silk Path Hotel located in the historic Silk district of Hanoi. This chic and sophisticated boutique hotel has an essence of classic luxury mixed with rich oriental heritage. The professional staff is ready to provide exceptional service to make all guests feel welcome. Guestrooms at the Silk Path are tastefully decorated and include modern amenities for your convenience. With two bars and two restaurants, the Silk Path Hotel is equipped to serve your every need. On the edge of Hanoi's fascinating Old Quarter close to Hoan Kiem Lake and the Temple of Literature. Gracefully designed rooms on higher-floors include modern furnishings and complimentary Wi-Fi access. Built in oriental style with contemporary luxury, Bhaya Cruises has established a new standard of cruising in Vietnam. The four Bhaya Classic vessels have a total 75 cabins and proudly present a premium cruise experience in Ha Long Bay. The comfortable cabins feature ensuite bathroom with shower and hairdryer and complimentary bottled water. The Paragon Saigon Hotel features a sleek, modern design. Enjoy sweepings views of the Saigon city from the rooftop pool, or indulge in a treatment at the spa. The hotel's central location makes it a perfect base to explore this bustling city. Located in District 1, this spa hotel is within a 15-minute walk of Ben Thanh Market and the Notre Dame Cathedral. Deluxe rooms are stylishly decorated in warm earthy colors and feature a city view, air conditioning, flatscreen satellite TV, and free WI-FI. The newly opened Saem Siemreap Hotel features elegant Khmer architecture. After a day of sightseeing, relax in the outdoor salt water pool, enjoy a massage at the spa, or sip afternoon tea in the lobby bar. Located in the city center, the hotel is just 5 minutes from the busy downtown and pub street, and a 15 minute drive from Angkor Wat UNESECO Heritage Site. Comfortable rooms are equipped with air condition, flat-screen TV, and free WI-FI. Located just 10 minutes from town, the Santi Resort & Spa is set in a tranquil setting surrounded by rice fields, creeks, and waterfalls. Each room is designed to reflect the local charm using wood and colorful fabrics. Dine in the two restaurants or sip on a drink in the bar. Located in beautifully landscaped gardens surrounded by mountains and natural streams, only a short ride to the center of town. Each room is designed with extensive wood accents and feature daily fruit basket, cable TV, and private balcony. Contemporarily elegant and tastefully decorated, the Sofitel Plaza Hanoi offers a genuine experience of sophistication and luxury. Within the elegant interiors, enjoy a contemporary aesthetic blended with beautiful Vietnamese touches and stately furnishings. Whether you choose to try the authentic dim sum dishes from Ming Restaurant or the international buffet at Brasserie Westlake, you will dine in comfort. Soothe tired muscles and step into an oasis of relaxation with a pampering massage or swim in the pool with retractable roof. The well-equipped fitness center offers guests modern facilities and various scheduled sessions of yoga, pilates, and aerobics. Ideally located within walking distance to the city center and Hanoi's Old Quarter, the hotel showcases panoramic views of the city. Each of the 273 rooms blends modern Parisian aesthetic with Vietnamese charm. Surround yourself in luxury accommodation with stately furnishings, comfortable signature Sofitel MyBed, complimentary Wi-Fi, high definition LCD TV, and nightly turndown service. Gaze out upon incredible vistas from the frameless panoramic windows of your room. This award winning French colonial style hotel is located in the heart of downtown Hanoi. The Opera Wing guestrooms feature a neo classic elegance, Sofitel's MyBed, and complimentary WiFi Internet access. After a long day take a dip in the heated outdoor swimming pool or visit the luxurious Le Spa du Metropole for an holistic spa treatment. The hotel features three on site restaurants offering fine French, Italian, and local cuisine along with three bars offering great choices for a night cap to a day of exploring. In the heart of the city within walking distance of Hoan Kiem Lake and the Hanoi Opera House. Rooms in the new Opera wing include plush Sofitel MyBeds and complimentary Wi-Fi access. Paradise Luxury I, II, III & IV were built according to the traditional Vietnamese design and present a lavish design blending in subtle harmony with the natural environment. The four Paradise Luxury vessels offer 68 luxurious cabins as well as an exciting array of activities to be enjoyed while experiencing the spectacular scenery of the "Bay of Descending Dragons". Each cabin features a private balcony, ensuite bathroom with shower, and complimentary bottled water. InterContinental Asiana Saigon is located in the heart of Ho Chi Minh City. The hotel features spacious rooms with separate bath and shower, a full service spa, outdoor pool, and a fitness center. Other amenities include three restaurants, a lounge, and a bar. In the city center within walking distance to Saigon Central Post Office, Notre Dame Basilica, and Diamond Plaza. Many shops and restaurants are also nearby. Rooms are equipped with LCD televisions with premium cable channels, DVD players, and beds with pillow top mattresses. Bathrooms offer separate bath and rain shower. Additional amenities include slippers and complimentary bottled water. The Liberty Central Saigon Citypoint Hotel is contemporarily designed with modern rooms and offers guests the utmost in quality, comfort and convenience. Unwind after a day of sightseeing at the café, restaurant or bar and check out the pool deck for incredible views of the metropolis below. Hit the gym, complete with sauna and steam room, or pamper yourself in luxury at their spa. Located in the city center, the Hotel is within walking distance of Le Loi Boulevard and many of Ho Chi Minh City’s key points of interest and nightlife venues. Guestrooms are built for comfort and relaxation and feature abundant natural light and plush bedding to ensure a restful stay. The captivating panoramic views also offer great views over the city. The Park Hyatt, Siem Reap is the city's most prestigious address and perfect base to explore the Temples of Angkor. Located in the heart of the city, this award winning hotel blends an elegant and contemporary design to create an enlivening resort and residential feel. From the second you arrive you will be welcomed by true Cambodian hospitality and superb service. The stylish guestrooms offer a refined home away from home with all the amenities one would expect from a deluxe hotel. The luxurious collection of accommodation is matched by stylish dining venues that offer fresh, flavorful, well-presented dishes of French and Indochine inspirations. Lighter fare is also offered at The Glass House, the onsite deli-patisserie. Discerning travelers will appreciate the other amenities on offer. Relax by one of the two pools or in the inviting Living Room lounge and bar, get in a work out in the fitness center, or visit The Spa for holistic therapies and treatments using only locally harvested floral and aromatic ingredients. Located in the heart of Siem Reap the hotel offers easy access to the Angkor temple complex and is just a 10-minute walk to the night market and popular pub street. Guestrooms feature Khmer-inspired contemporary art, custom furniture and decor that creates an exotic, resort-like ambience. Each spacious room also features a sitting area, complimentary Wi-Fi access, welcome fruits that are replenished daily, and bathrooms with Italian marble, dual vanities, and separate bathtub and rain shower. Aptly named after 'a territory of Angkor' in Cambodian, Borei Angkor Resort & Spa is a truly Cambodian hotel set in the heart of Siem Reap with easy access to the Angkor Temple complex and only 5 minutes from Pub Street with shops and restaurants. The hotel features many amenities for a comfortable stay including an outdoor pool, spa, fitness center, restaurant, and bar. Located just 5 minutes from the center of Siem Reap with easy access to the Angkor temple complex, Pub Street, and the night market. Rooms are inspired by Angkorian architecture and decorated with Cambodian silk products, assorted handicraft, and wooden floor. A private balcony overlooks the refreshing pool. Maison Souvannaphoum was the residence of Prince Souvannaphouma in the 1960s and 1970s, making it one of the few "historical" modernist buildings in town. The hotel exudes a distinct colonial style of solid brick structures with shuttered windows, reminiscent of French provincial buildings, added with a local touch. 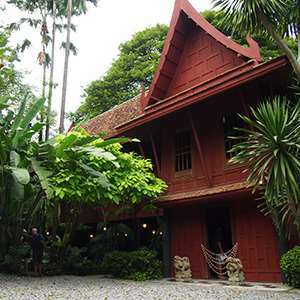 Live in the abode of Laotian royalty as each garden-view room includes air-conditioning and complimentary Wi-Fi access. 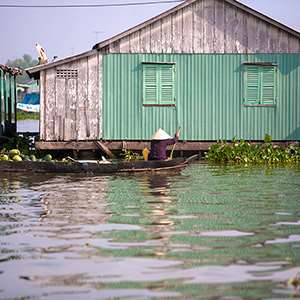 Hop aboard a traditional Cambodian watercraft and set out with an expert Local Guide to explore life on Tonle Sap-the largest freshwater lake in Southeast Asia! Step back in time as we introduce you to the wonders of Khmer music, dance, and cuisine. We'll transport you to the beautiful Angkor Village Resort for a tantalizing dinner of authentic Cambodian dishes. Then, ancient Khmer culture comes to life during a brilliant Apsara dance performance, an artform based on the bas-reliefs found at Angkor Wat. Marvel at the graceful, sinuous hand gestures that tell the stories from classical mythology. 'Enjoy the performance of the Circus of Battambang now in Siem Reap! Phare Ponleu Selpak, meaning "the brightness of art", originated in 1986 in Site 2 Refugee Camp on the Thai border. 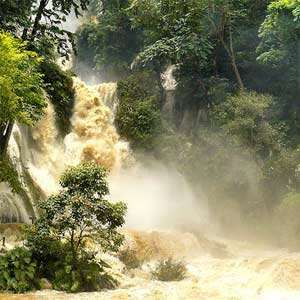 Laos may be a landlocked nation without oceans or beaches, but the triple-tiered, turquoise Kuang Si Waterfall more than makes up for it. Monograms provides travelers access to a Local Host®, so you will have someone on hand to answer those vacation questions pertaining to Hanoi. No waiting in line at the concierge desk or trying to ask your waitress at breakfast directions to the shopping district. Simply ask your Local Host about Hanoi and you'll be on your way in no time. Plus, your Local Host will share local Hanoi, Vietnam insights and share suggestions for getting off the beaten path, leaving you more time to create lasting vacation memories that are yours alone. Hung graduated from Hanoi National University in 1998 after studying English. He started his career in tourism shortly thereafter and has over a decade of experience leading tours through Vietnam. He possesses comprehensive knowledge of Vietnam, with interests extending to politics, history, and cultural traditions. His interest in photography and local landscapes makes him the perfect guide for snapping the ideal shot. Hanoi’s lively Old Quarter is famous for its small artisans and merchants including many silk shops. At the beginning of the 20th century, each of the 36 streets that today make up the Old Quarter, had merchants and households that specialized in a particular trade such as silk, cotton, leather, silver etc. These days the street names reflect these specializations although few of them remain exclusively in their original commerce. Local cuisine specialties as well as several clubs and bars can be found here as well as a night market open every Friday, Saturday, and Sunday evening with a variety of clothing, souvenirs and food. Meaning Lake of the Returned Sword or Lake of the Restored Sword, Hoan Kiem Lake in the historical center of the city, is a lovely place to relax and enjoy the atmosphere or to take a leisurely stroll. It is one of Hanoi’s major scenic spots and a focal point of public life. There are some good photo opportunities around the shores of the lake. Don’t miss a fascinating performance of Hanoi’s renowned Water Puppets, a traditional art form dating back to the 11th century. Monograms provides travelers access to a Local Host®, so you will have someone on hand to answer those vacation questions pertaining to Ho Chi Minh City. No waiting in line at the concierge desk or trying to ask your waitress at breakfast directions to the shopping district. Simply ask your Local Host® about Ho Chi Minh and you'll be on your way in no time. Plus, your Local Host® will share local Ho Chi Minh City, Vietnam insights and share suggestions for getting off the beaten path, leaving you more time to create lasting vacation memories that are yours alone. I'm Tuyen and after graduating tourism university in 1997, I started work as a full time tour guide. I'm excited to show our beautiful country to more international friends and am looking forward to serving you and making your stay in Vietnam unforgettable. Home to the infamous “Five O’clock follies” and a favorite hangout for American officers during the Vietnam War, this rooftop bar still evokes memories of a time long past. The furnishings are a bit kitschy, but that is part of the charm. Stop for a drink or dinner and enjoy the great city views. Cholon is the Chinatown of Ho Chi Minh City and gets its name from Cho Lon, which means “big market” in Chinese. This intriguing area is teaming with restaurants, temples, shops, and buzzing markets. The two primary markets are Binh Tay and Ben Thanh. These massive markets offer similar products and are a great place to experience the local culture, browse the many stalls, and sample great authentic local cuisine. This city comes alive at night, and a “cyclo” ride is the perfect way to experience the sights, sounds, and smells of the city. Sitting in the front of this 3-wheeled bicycle gives you a great view as you slowly meander through the streets. Although a rare occurrence, some “cyclo” riders may try to charge you too much or take you to places you don’t want to go, so make sure to negotiate the price and clearly state your destination before the ride begins. Running from the Notre Dame Cathedral to the waterfront, this shopping area is well known for the quality of its goods. Here you can buy custom made silk garments that rival those of Hong Kong for a reasonable price. The workmanship is extraordinary. Among other items for sale are jewelry, handbags, tablecloths, ceramics, and scarves. If shopping isn’t your thing, this is still a great place to take a stroll to explore the city. This popular rooftop bar, in the iconic Caravelle Hotel, offers sweeping views of Ho Chi Minh City. Stop by for a drink at dusk and enjoy the spectacular view as the sun sets and the city lights up. Live music is featured nightly. You don’t have to dress up, but no shorts please. Ton That Thien Street is a great place to shop for Vietnamese and propaganda posters. You can also find funky lacquer ware and costume jewelry shops. Enjoy acrobats, contemporary dancers, jugglers and martial arts experts, with musical accompaniment at a performing arts show. The A O Show (pronounced Ahhh! Ohhh!) has been performing to rapturous acclaim since 2013. Depending on the time of year the troupe may offer performances of My Village or The Mist, which are equally engaging. Each show takes the audience on a journey of Vietnamese life. Monograms provides travelers access to a Local Host®, so you will have someone on hand to answer those vacation questions pertaining to Siem Reap. No waiting in line at the concierge desk or trying to ask your waitress at breakfast directions to the shopping district. Simply ask your Local Host® about Siem Reap and you'll be on your way in no time. Plus, your Local Host ®will share local Siem Reap insights and share suggestions for getting off the beaten path, leaving you more time to create lasting vacation memories that are yours alone. Hi, I'm Bunrith. I was born in Siem Reap and spent all my time there until I graduated high school in 1993. My first job was with a hotel and later, in 1998, I became a guide. I have been a full-time guide since and enjoy showing guests my home city and the surrounds. Located in the French Quarter of Siem Reap, Psar Chaa or “Old Market” is where locals come to shop for their everyday needs. 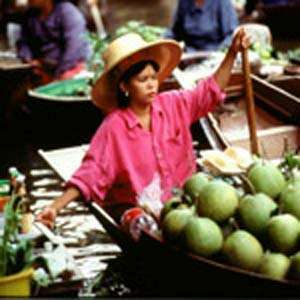 As with many local markets, Psar Chaa is a great place to wander around and mix with the locals. It is also the best place to sample authentic Khmer food, which has much in common with Thai and Vietnamese cuisine. Rice is the main staple and is often served with pork or fish. Noodles are also popular, as is curry. But for the more adventurous, try the spiced frog, a very satisfying meal. You will also find plenty of shops catering to tourists with items like t-shirts, maps, books, and Buddha heads—all for much less than you would pay in a store. Be prepared to haggle! Distinctly different from Psar Chaa or “Old Market,” the colorful Night Market was created for tourists. Here you will find stalls selling every type of souvenir you can imagine. There is also a bar and a movie mall at one end. It is located close to the main street that is lined with restaurants and bars, so it makes for a good walk after dinner. Inspired by old Shanghai, this bar is one of Siem Reap’s newest additions. The cherry-red lantern that dangles from the doorway beckons passers-by. Inside, slip into one of the intimate leather booths for an Indochine Martini, a mixture of vodka, ginger cognac and fresh pineapple juice. The Angkor National Museum features eight chronologically ordered galleries where many Angkor-era artifacts are on display. Several multi-media presentations give an understanding about Angkor history and culture. Theam's House is the home of Cambodian artist and designer Lim Muy Theam. Set beside a tranquil environment, the handsome traditional wooden house with its lust tropical garden holds a unique private collection alongside products conceived and created on site. Works demonstrate traditional Khmer arts & craft with a personal touch of design and modernity. The Khmer Ceramic & Fine Arts Centre is dedicated to the renaissance and appreciation of lost Cambodian art, pottery, ceramics & tableware. Founded in 2006 its goal is to revive the skill and knowledge needed for this technically challenging and beautiful handcrafted art form. Find contemporary tableware, vases, and more inspired by Cambodian culture and environment, that are both functional and decorative. Monograms provides travelers access to a Local Host®, so you will have someone on hand to answer those vacation questions pertaining to Luang Prabang. No waiting in line at the concierge desk or trying to ask your waitress at breakfast directions to the shopping district. Simply ask your Local Host® about Luang Prabang and you'll be on your way in no time. Plus, your Local Host® will share local Luang Prabang, Laos insights and share suggestions for getting off the beaten path, leaving you more time to create lasting vacation memories that are yours alone. Hello, I'm Toobee, and I was born in Luang Prabang. After successfully completing upper-secondary school, I went to Vientiane, the capital of Laos, to study English and accounting at the English college and vocational school. I returned to Luang Prabang in 2001 where I worked at the reception desk in a hotel. In 2004, I became a guide and I am now one of the top English-speaking guides in Laos. This is a great place to pick up an affordable souvenir or simply mix with the locals. Browse the stalls for a large variety of local handicrafts including wood carvings, silk textiles, wall hangings, and much more. The market closes around 9 pm and is a perfect activity before or after dinner. This delightful bookshop serves light fare throughout the day and features an extensive tea and drink menu. This is a great place to unwind with a book, chat about your travel experiences, or stop by at night for an “artsy” movie. Once banned for 15 years, the Royal Ballet Theatre is alive and thriving again thanks to support from the Institute of Cultural Research. 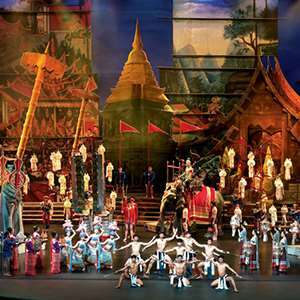 Aimed at preserving Laos’ cultural heritage, dancers perform scenes from the Lao-Ramayana, traditional folk dances and tribal dances. The Bamboo bridges, that run across Nam Khan River connecting Luang Prabang to small local villages, offers great short walking opportunities to discover Lao life, restaurants and handicraft shops (Available only during the dry season, 8 am – 6 pm, Oct. – May). Visit My Library to talk to ambitious young people from surrounding underprivileged areas who come to further their education, learn English, and computer skills. The facility continues to grow in popularity as users experience the benefits of this non-profit organization. Visit a stunning Mekong riverside garden at the Ock Pop Tok Weaving Centre, which provides employment to rural residents to preserve the country’s centuries old art of weaving. Meet the weavers and learn the intricacies of Lao weaving and the preparation of natural dyes. Dye your own silk scarf to take home as a souvenir.